“Four Seasons” is a whimsical depiction of a child at play through the seasons, each represented by one of the four sides of the utility box. Located on the campus of Shaker schools, the design captures the wonder and joy of childhood. After the design was completed, the image was reproduced on vinyl material and wrapped around the box in a process expected to withstand five to seven years of Ohio weather. 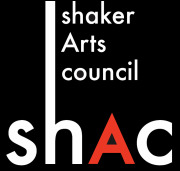 Plans to commission a series of decorated boxes to adorn the city landscape of Shaker Heights are underway. The artist, Maisha Afrikah Lewis, is a 2016 graduate of Shaker Heights High School. The utility box art wrap is the culmination of her Senior Project under the direction of art educator Karen DeMauro. Ms. Lewis is currently a student of Visual Communication Design at Kent State University. The aspiring graphic designer credits the art department and especially instructor Keaf Holliday of inspiring students to “go above and beyond” and never give up on their artistic endeavors. 5. Art is painted on the side of Loganberry building 13015 Larchmere Blvd.